More mulch churned up by deer and by whatever made those 4-5 inch tracks, a strange “paw” print on the house siding, and a family even more perplexed about what’s lurking literally in their back yard–these were what fellow investigator Jay Bachochin and I found on a return to the residential site in Hartland where a woman saw a six-foot tall, upright wolf-like creature cross her back yard at 1:30 a.m. the night of July 17-18, 2014. I invited Bachochin, founder of the WPI (Wisconsin Paranormal Investigators) to help conduct a more thorough search of the grounds. The owners also graciously invited us to use their deck for a late night stakeout. We were able to sit quietly in the dark with a perfect view of the yard, cameras at the ready, and confirmed that the eyewitness would indeed have been able to see and identify a large creature from that position. We also spent some time viewing the neighborhood by foot and by car to see just how much cover there was for a large predator — and found a surprising amount of wooded ground that would allow it to make its rounds and then escape to a freeway corridor (US Hwy 16) when ready to return to the lake-and-park-rich surrounding area. The mulched garden at the back of the yard had seen a lot more activity in the three days since my first visit. There were so many more prints–both from deer and the larger predator–that a lot of them had blended. But as can be seen in the above photo, there still were plenty of distinct trackways. 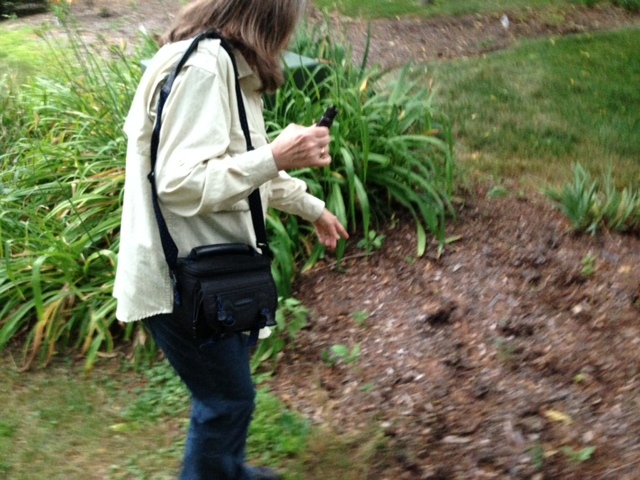 The 5″ print size and the much smaller deer prints both remained consistent. 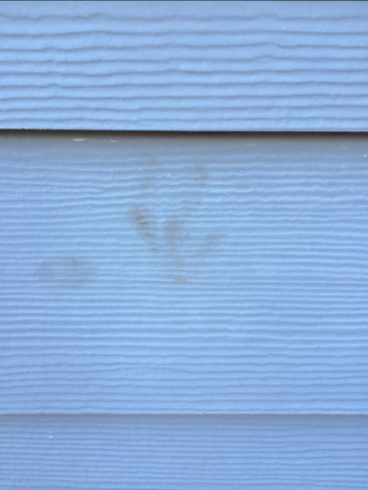 The owner hadn’t (and still has not) caught an image on her trail cam, but she did find a strange mark on the house siding that looks like a partial paw print. It seems to be made with fine dirt, and measures a little over four inches. It’s located four feet above the ground, too high (and too big) for a raccoon or the family’s little dog. 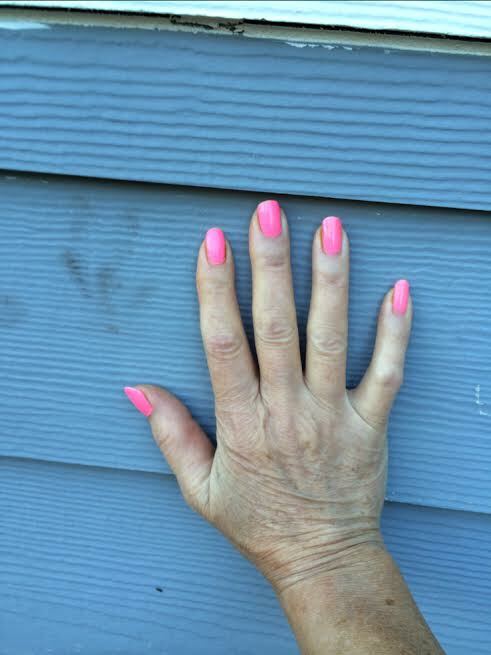 None of her family members have hands that size, and there was only one print. It may be entirely unrelated to the creature, but there are rear paw tracks in the mulch below and all around the house that tell us something large was there. She also called the police again to ask whether there had been more sightings. The officer she spoke to this time said no, but that the department would be alerted. As for our stakeout, we saw one small, scrawny and possibly sick raccoon in the neighbor’s yard, and what appeared to be a smallish coyote sniffing around another neighbor’s garbage. Neither would ever be mistaken for an upright, six-foot dogman. I consider the case to be ongoing, and I’m staying in close contact with the family. I need to make one other note; I’ve received a comment or two from a couple of readers who assume I’m out hunting actual werewolves and using firearms and traps. That’s so very wrong. This is not Mountain Monsters!!! I don’t carry a rifle or create cages from the local junk yard, and Jay and I both left our long coats at home. I investigate with cameras, tape measures and Google maps, and I don’t believe the creatures I document are traditional lycanthropes in any way. And just for the record, July’s full moon was on the 12th. I’ll continue to keep you all posted! American Monsters: a History of Monster Lore, Legends and Sightings in America,is scheduled for August 28th! It’s a wide, wide world of unknown creatures out there, from giant birds to Sasquatch, and this book trails them all by air, water and land. While waiting along with everyone else to see whether Dr. Melba Ketchum’s DNA study and/or the allegedly captured Bigfoot code-named Daisy hold any water worth wading into, I have been looking back at some of the better ‘Squatch reports I’ve received and collected from SE Wisconsin over the years. 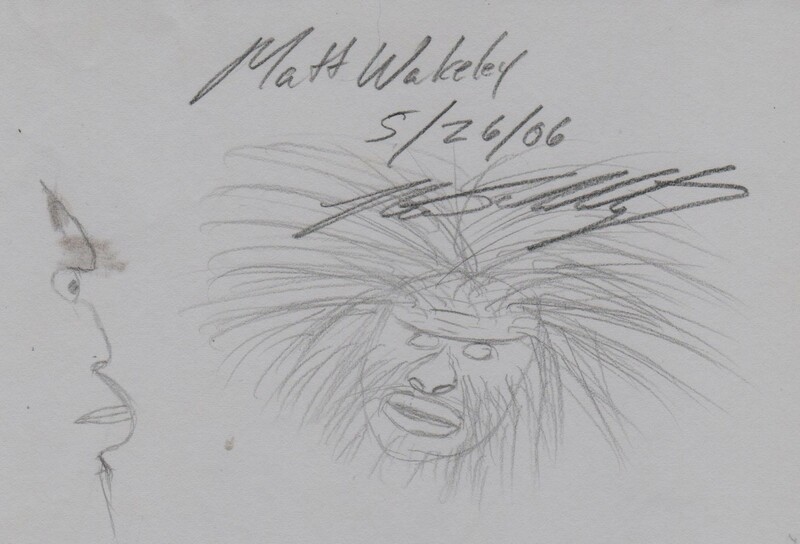 One of my favorites is the so-called “Bad Hair Day Bigfoot” observed by Matt Wakely in September 2005 SE of Lake Geneva, near the WI-IL border. The incident is described in full in my book Hunting the American Werewolf, and Wakely passed a polygraph exam of his story on the Monsterquest “American Werewolf ” episode. (The show didn’t mention he saw a Bigfoot rather than a dog man).  This was a daylight sighting where the witness had a good long look at the creature. He called his mother and told her he had just seen a caveman, naked and covered with fur. The creature seemed totally unafraid of Matt, and its most unusual feature may have been its rather wild hairdo. My best guess is that it was perhaps an adolescent that had just risen from a midday nap in the cemetery, where it stood with 1 foot on a head stone. It also had less facial hair, according to Matt’s description, than any other Bigfoot ever reported to me. This also suggests an adolescent age group, but more importantly, it gave Matt an unusually clear look at facial features. Matt drew his own sketches ( below) and then worked with me to achieve what he agreed looked a pretty fair facsimile of what he saw. At that time, I privately thought the face seemed a bit too human, but my job is to draw and report what the witness saw without projecting my own biases. 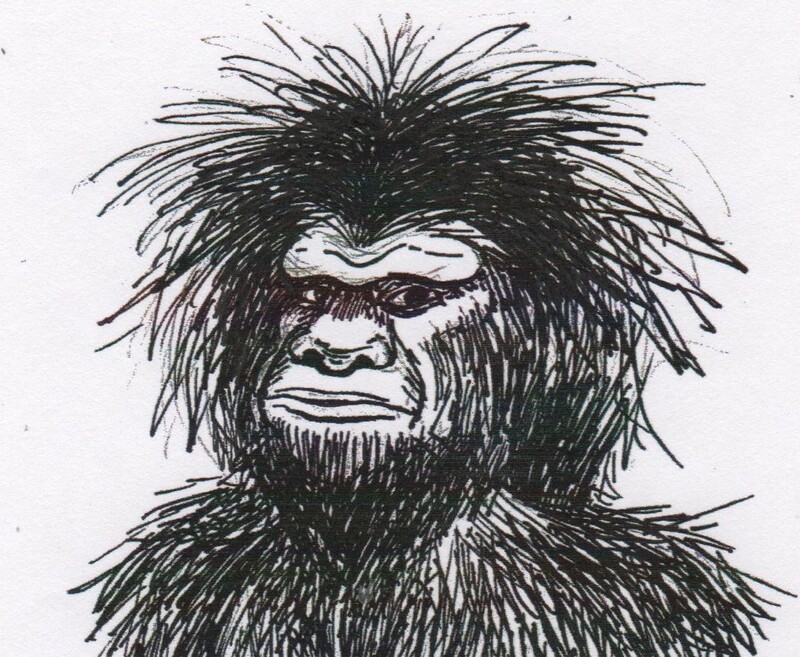 Over the past year, as I had my own encounter and gathered more local evidence, it’s occurred to me that if Ketchum’s study proves valid and Sasquatch is indeed genetically part human , then this drawing may be a closer stab at a real portrait than I previously believed. And Matt’s tag of “caveman” may have been very accurate! Sure, almost every character has shot or been shot by another character (or both), and people pop in and out of comas like the little heads in a Whack-a-Mole game. Affairs and kidnappings occur with the regularity of a Boomer on a fiber supplement, and every scene ends with one character staring vacantly into the camera so that the audience will come back for The Response. This is what soap operas DO, and I am distraught that As the World Turns won’t get to do it any more, come September. This neverending charade of misery has been my guilty pleasure on and off since my mother hooked me in high school during summer vacation, and I am going to miss Carly, Barbara, Jack, Lucinda, Margo, Emily, Kim, Bob, Lily, weird Paul and even perky Katie and stolid Holden like I would miss a big pack of familymembers that suddenly disappeared. I don’t get to see it every day but most soaps can be caught up with in about the first ten minutes every five years or so. It’s one reason they are so popular. They never make you feel dumb. Besides, ATWT has hatched such stars Meg Ryan, Marisa Tomei and Julianne Moore and scored enough daytime Emmies to fill the party goods warehouse where Barbara has recently been held hostage by evil Iris Dembrowski. That’s proof enough it’s quality entertainment. Besides, this show has entertained daytimers for 54 tear-stained years. With backstory like that, the characters in ATWT are so multi-dimensional that they frequently shapeshift from beloved heroine to hated villainess and back in the same episode. Of course, often that gets them committed to mental health institutes (I hope Meg gets out before the show ends). Watching ATWT has even taught me a few things that have come in handy in my own work: mainly, that people will watch (read) anything if they care enough about the characters, and that a writer must never leave a scene without a gasp uttered, a secret learned, a body discovered, an illicit kiss stolen, a villain snickering, a hero passing out, a patient’s amnesia starting to lift, a pregnancy test stick turning pink, or a note carelessly tossed into a wastebasket from which it is sure to be retrieved. But don’t misunderstand; I am not trying to justify having watched ATWT all these years — I am pretty much over the guilty part of the pleasure. I merely mourn the passing of old friends who wear designer gowns to the local burger joint and get really great facelifts every few years so that they never seem to age. I do so love fantasy. March 24, 2010, “MonsterQuest: America’s Wolfman” 9pm/8pm CENTRAL on History. On March 24, 2010, the MonsterQuest Season Finale examines one of the most controversial pieces of video evidence ever captured, as the team scours the Midwest for a seven-foot wolf-like monster that witnesses believe is a werewolf. On Wednesday at 8 p.m. Central on History, the episode “MonsterQuest: America’s Wolfman” closes out the fourth season of the popular investigative cryptozoology series. An expedition team will try to uncover the truth about what is striking fear into witnesses, while the science team will expose the truth behind “The Gable Film,” an internet phenomenon that is possible evidence of a werewolf-like creature. The film, shot on grainy 1970s Super 8, captures a hairy creature running on all fours toward the camera in an apparent attack, prompting widespread debate over its identity and authenticity. This episode of History’s highly acclaimed series features appearances by Wisconsin werewolf researcher Linda Godfrey and Michigan DJ Steve Cook, who first posted the Gable Film. 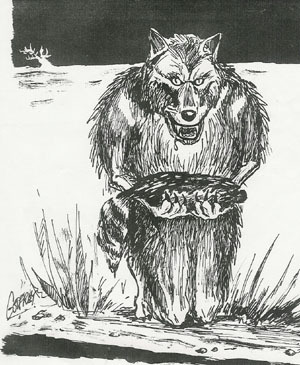 There are frightening stories from witnesses including a former contractor for the Wisconsin Department of Natural Resources and a Deputy Sheriff, who all claim to have encountered this mystery creature that has been part of local legend for centuries. MonsterQuest is produced by Whitewolf Entertainment; the episode “MonsterQuest: America’s Wolfman” is produced by Chicago’s Frank Haney Films. We are not Mennonites and we do not raise beets. 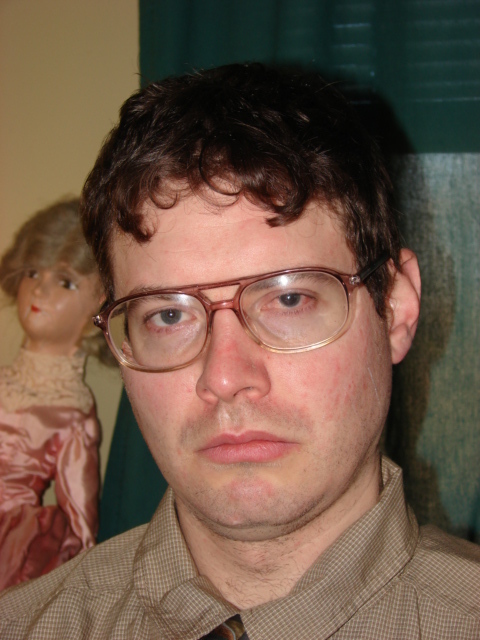 And yet, everyone tells me I have raised a doppelganger of Dwight Schrute, favorite nerd of NBC’s The Office. 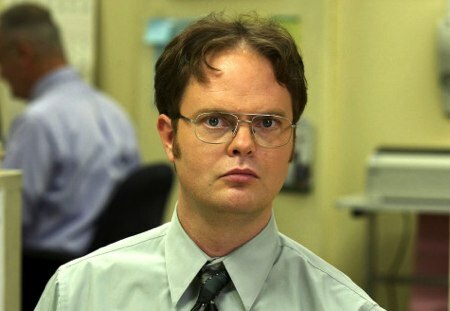 Take my poll: How much does Dieter resemble Dwight? It was really hard to choose a category for this post. Is the Beast of Bray Road a celebrity just because it’s being featured on Sean Hannity’s Fox News Channel show this Friday (9-midnight Eastern time)? That’s a toughie, but the creature IS going to be on national TV, so I finally chose the “celebrities, TV, movies” label. However, there have been so many clips of the late Michael Jackson looking werewolfish in his “Thriller” video this past week that the real-life incidents described on Fox may seem tame by comparison. The six-minute segment will include yours truly and witnesses Steven Krueger and Katie Zahn. Krueger is the former DNR roadkill remover contractor who had a deer carcass nabbed from his truckbed by a 7-foot tall wolf-headed creature in 2006 near Holy Hill, north of Milwaukee. Zahn has been seen on H.C.’s “Monsterquest” episode, “American Werewolf” where she passed a polygraph test on her encounter with multiple Manwolves in southern Rock County. It also will examine that controversial Gable Film my friend Steve Cook has so thoroughly explored and now opened to everyone as a “creative release.” I have not seen this on any other national program. Hannity sent producer Tim Rhodes to Elkhorn just ahead of a big thunderstorm in late June and managed to film us in the Kettle Moraine State Forest, grab a few b-roll shots of Bray Road, and then flee the approaching “scattered tornadoes” local weather guys were predicting, all in one day. He promised us a fair treatment, and seemed genuinely interested in the strange fact that hundreds of people around the US and world claim to have seen what looks like a huge, intelligent wolf walking,kneeling, or running on its hind legs. Open-minded curiosity…always a good sign. The segment will appear on the show’s regular “Conspiracy Month” feature. See the above Hannity link for a gander at his take on the Honey Island Swamp Monster.